Liquefied natural gas prices may be about to hit the bottom after losing more than a third of their value this year. 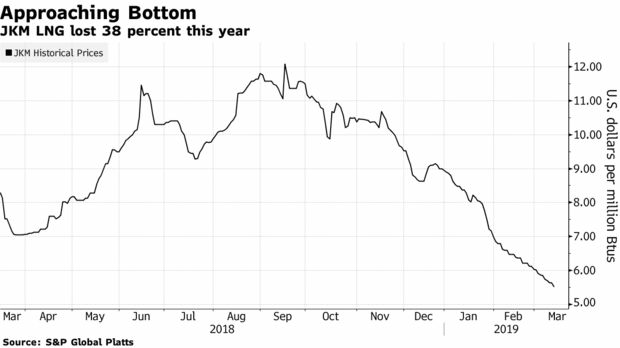 Sellers of the world’s fastest-growing fossil fuel may first have to swallow a cut of another 10 percent over the next two months before prices rebound from the lowest since July 2017, according to traders surveyed by Bloomberg News. It might be good news for the climate, as price-sensitive users in India and Bangladesh switch to cleaner natural gas from oil and coal. Asia, the biggest consuming region for LNG, uses most of it for heating and power but a mild winter, an abundance of new supplies and a better preparedness of Chinese buyers meant prices went against the trend over the past few months by falling rather than rising. Traders are now watching for signs that summer cooling demand and buying by price-sensitive nations will spur a rally. “LNG prices could have further downside heading into the second quarter, but should find support from demand in India, South Korea, China and Thailand towards the third quarter,” said Nick Boyes, a senior gas and LNG analyst at Swiss utility and trader Axpo Group.LNG for April delivery to North Asia slipped 13 cents to $5.52 per million Btu on Wednesday, the lowest since July 2017, according to S&P Global Platts. Prices are still dropping because more spot cargoes are entering the market and buyers in Japan, South Korea and China — the biggest users — are holding off from purchases. India, which is seen emulating China in its unprecedented use of LNG to fight air pollution, may burn more gas rather than dirtier coal if LNG prices fall to $5 per million Btu, according to Energy Aspects Ltd. At $6, there will be little increase in India’s power sector demand given prevailing coal prices, the industry consultants said in a note. There are already signs that the price slump is boosting demand. India’s Torrent Power Ltd. bought an LNG cargo for May 26 at the high-$5 to low-$6 per million Btu level including transport and delivery and Reliance Industries Ltd. is looking for 12 cargoes through March 2020. Emirates National Oil Co. was seeking four cargoes for delivery to India between April and July, according to traders. The price of cargoes for late June were above those for early May in a recent spot supply tender in neighboring Pakistan, a further indication that the end of the slump is approaching.